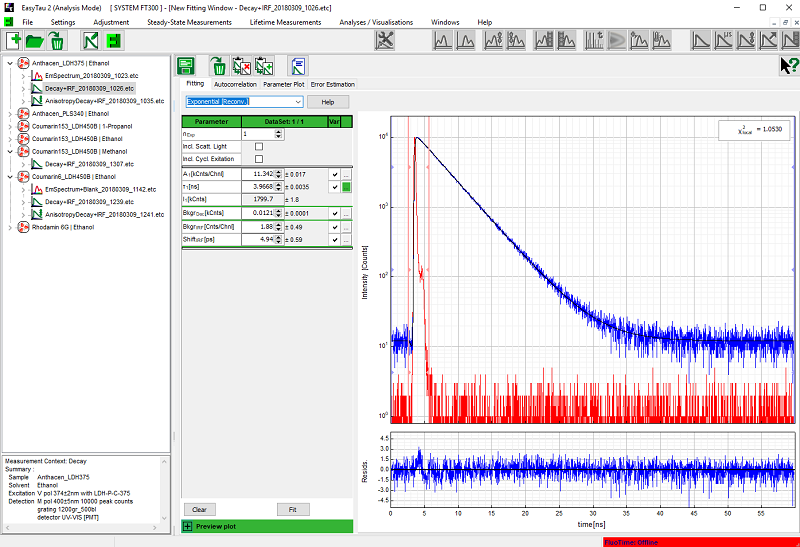 The EasyTau 2 software package is the one-stop solution for both full hardware control of the FluoTime 250 and FluoTime 300 spectrometer as well as for interactive data analysis and fitting It can also be used as a data analysis software for custom set-ups based on PicoQuant TCSPC electronics. 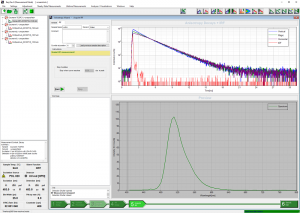 The integrated analysis and fitting module supports a broad range of fluorescence spectroscopy applications, such as steady-state excitation and emission spectra, fluorescence or phosphorescence lifetimes, or anisotropy measurements. EasyTau 2 combines and improved on the features of the previously separate FluoFit and EasyTau software in a single, easy-to-use package.. 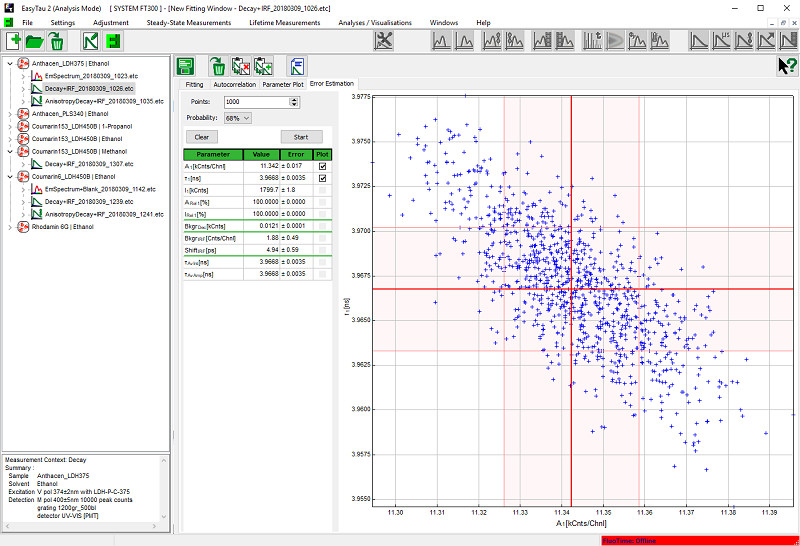 The software package EasyTau 2 provides full control over all operational aspects of the FluoTime 300 fluorescence spectrometer in an intuitive and efficient way. A wide range of steady-state and time-resolved measurements can be carried out using a single graphical user interface. Supported methods include, amongst others, measurements of fluorescence or phosphorescence lifetimes, anisotropy, steady-state excitation and emission spectra, or Time-Resolved Emission Spectra (TRES). EasyTau 2 features specially designed applications wizards that guide a user through all optimization steps, enabling even novice users to perform such experiments. A customized measurement mode is provided for advanced users that desire full control over every instrumental parameter for every application. 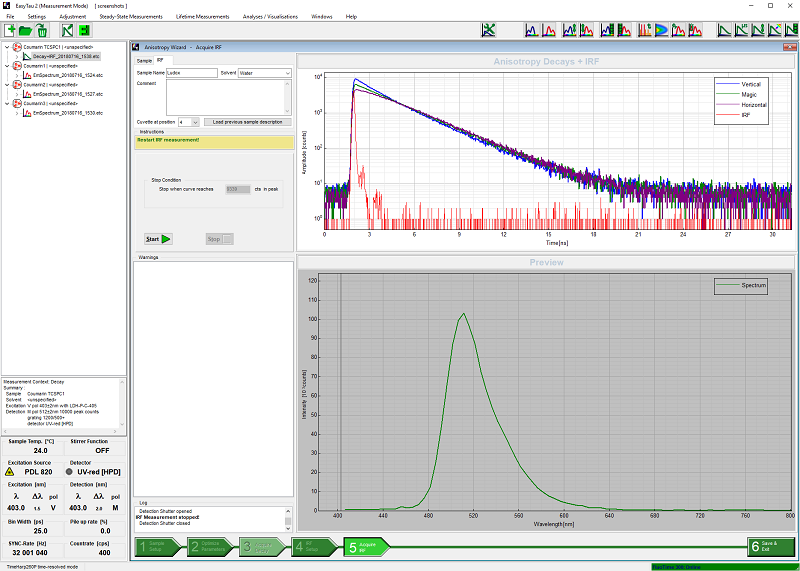 Complex applications, such as e.g., alternating between measuring time-resolved decays and steady-state spectra at different temperatures, can be easily automated by using the included scripting language. EasyTau 2 also provides an interface for remote execution of scripts, so that the automation can be extended to third-party accessories such as robotic autosamplers. 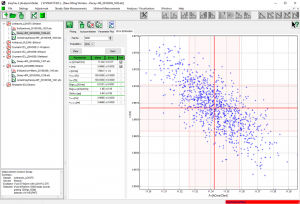 The fitting and analysis module of the EasyTau 2 combines powerful, yet easy-to-use algorithms with efficient data management. It is not only capable of handling results of the FluoTime 250 and FluoTime 300 spectrometer, but can also import data from all PicoQuant TCSPC modules as well as ASCII files. 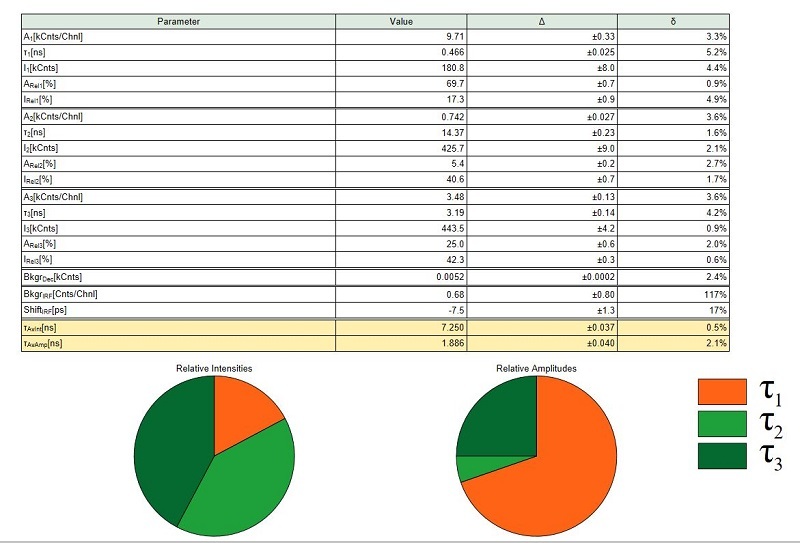 The intuitive and interactive graphical user interface makes performing global decay as well as error analysis a breeze. All measured data is stored along with its related analysis results in a familiar file tree structure, that makes data dependencies visible at a glance. 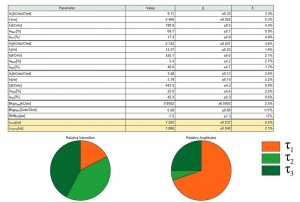 The module also comes with a powerful report generator to create presentation-ready plots or tables (as PDF or HTML files). 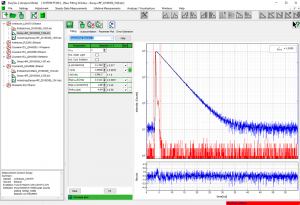 EasyTau 2 supports both tail fitting and numerical reconvolution to account for the finite Instrument Response Function (IRF). 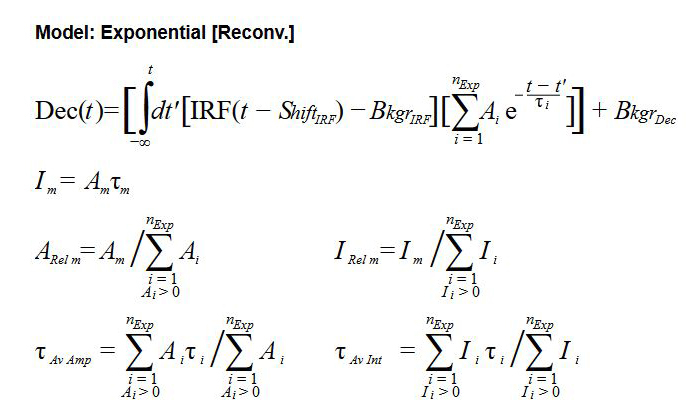 Various models can be fitted to the decay data, including exponential decay (up to 5th order) or other distribution models, such as Gaussian, Lorentzian, or stretched exponential. All models support both global and batch mode fitting. The interactive graphical user interface simplifies setting starting parameters as well as fitting limits. Reduced chi-square, weighted residual and an autocorrelation trace are provided to assess the goodness of a fit. 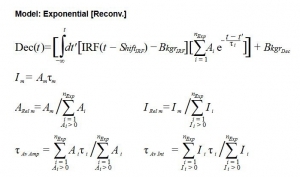 Additionally, a bootstrap error analysis can be carried out for every fit. This is the initial release. Note: the software is protected by a USB dongle and will not work without it. Please contact PicoQuant if you want to update EasyTau version 1.x or FluoFit to the latest version.